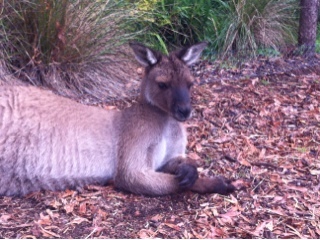 Angie's Adventures: I petted a kangaroo! I'm a few days behind. It's been busy, and I'm just getting caught up. My next day in Melbourne was relaxing. It started off with me sleeping for 11 hours. Yes, 11. I didn't sleep at all on the flight over and I was tired. When I finally woke up, Julie took me about an hour away to visit the zoo. It's not your typical zoo with animals from far away. It is an animal rescue place that houses local Australian animals. We saw birds, koalas, and kangaroos. The zoo was very open to its guests touching the animals. 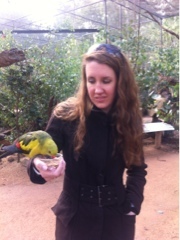 First, I held a small bird. 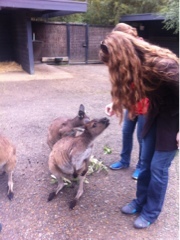 Then, we fed the kangaroos. They were surprisingly friendly and reminded me of a dog. We had also planned to hug a koala, but apparently this is now illegal in Melbourne. One too many koalas scratched one too many tourists. On the way back, we stopped by Julie's gym. She and her brother Adam are on a net ball team and they had a game. The game setup looks a lot like basketball. Since I've never played either, it makes it a bit hard to compare and contrast. 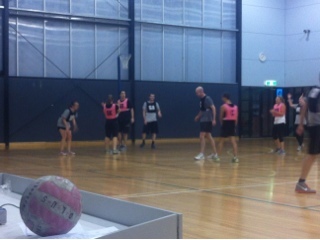 The good news is that their team won! After net ball, we headed to a local Irish pub. It was nice to have pub food, since I had such a hard time finding it in Ireland! Nicole from Memphis joined us with her boyfriend Ben. It was so nice to catchup with Nicole (despite the screaming singer on stage next to us!). We drank Guinness and caught up. I ate a shepard's pie, Nicole had the best calamari I've ever tasted, and Julie ate a chicken parm. Apparently chicken parmesan is very popular here. We called it an early night around 11 since we were all tired, but we vowed to meet for breakfast the following day.